Catherine E. Harnois is a Professor in the Department of Sociology and a core faculty member in the Department of Women’s, Gender, and Sexuality Studies at Wake Forest University. Her research is located at the intersection of sociology and feminist studies, and has appeared in the journals Gender & Society, Ethnic and Racial Studies, Sociological Forum, Sociological Perspectives, and the National Women’s Studies Association Journal, in addition to other scholarly outlets. Dr. Harnois’ research is rooted in multiracial feminist theory – the broad range of scholarly, activist, and creative writing, produced primarily by racial- and ethnic-minority women, in which the intersections of race, gender, class and other systems of inequality are critically analyzed and contested. As a quantitative sociologist, Dr. Harnois is interested drawing attention to the analytic insights of intersectionality for social science research methods. 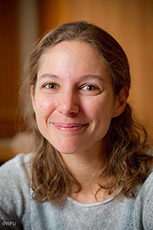 A major theme of her research concerns how social science research practices, particularly those that are quantitative, often result in narratives that obscure diversity and reproduce social inequalities. A second stream of research focuses on the prevalence and correlates of intersectional discrimination (i.e., discrimination based on multiple social statuses). Her current research brings an intersectional analytic and theoretical framework to the study of social identities and political consciousness. Dr. Harnois’ work on the importance of intersectionality for measuring and modeling racial-ethnic discrimination received the 2012 Outstanding Contribution to Scholarship Article Award from the American Sociological Association section on Race, Gender, and Class. Her book, Feminist Measures in Survey Research (Sage Publications, 2013) draws from feminist philosophies of science, standpoint theory, and multiracial feminist theory to consider what it means to bring an intersectional approach to social science survey research.